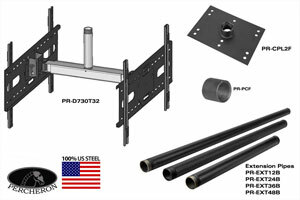 Percheron offers several packages for Dual Medium / Large TV Ceiling Mounting with 32" Panel Separation. All of the packages come with the Percheron PR-CPL2F Large Ceiling Mounting Plate along with the Percheron PR-D730T32 Double Ceiling TV Mount. Depending on the package selected, we offer different extension pipes and couplings. Medium / Large Flat Panel TV Ceiling Dual Mount with Tilt, 12" Drop. Complete kit includes 32" Double Ceiling Mount, Extension Pipe, two Mounting Plates, Flat Ceiling Plate. Monitors may be positioned back to back or side by side, depending on size. Medium / Large Flat Panel TV Ceiling Dual Mount with Tilt, 24" Drop. Complete kit includes 32" Double Ceiling Mount, Extension Pipe, two Mounting Plates, Flat Ceiling Plate. Monitors may be positioned back to back or side by side, depending on size. Medium / Large Flat Panel TV Ceiling Dual Mount with Tilt, 36" Drop. Complete kit includes 32" Double Ceiling Mount, Extension Pipe, two Mounting Plates, Flat Ceiling Plate. Monitors may be positioned back to back or side by side, depending on size. Medium / Large Flat Panel TV Ceiling Dual Mount with Tilt, 48" Drop. Complete kit includes 32" Double Ceiling Mount, Extension Pipe, two Mounting Plates, Flat Ceiling Plate. Monitors may be positioned back to back or side by side, depending on size. Medium / Large Flat Panel TV Ceiling Dual Mount with Tilt, 68" Drop. Complete kit includes 32" Double Ceiling Mount, Extension Pipe, two Mounting Plates, Flat Ceiling Plate. Monitors may be positioned back to back or side by side, depending on size.